Estádio da Luz, officially named Estádio do Sport Lisboa e Benfica, was built to provide Benfica with a new and modern home, and to serve as the playing venue for the Euro 2004 final. Estádio da Luz got built in place of the old Estádio da Luz. Construction works started in 2002, and in March 2003 Benfica played their last game at the partly demolished old stadium. The new stadium opened on the 25th of October 2003 with a match between Benfica and Uruguayan side Club Nacional (2-1). During the Euro 2004 Championships, Estadio da Luz hosted three group matches, the quarter-final between Portugal and England (2-2), and the final between Greece and Portugal (1-0). In 2014, the stadium hosted the Champions League final between Real Madrid and Atletico Madrid (4-1). 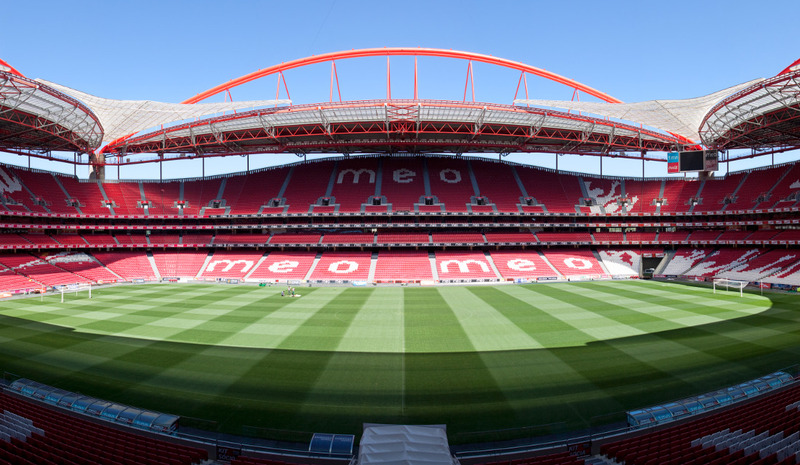 Estadio da Luz is located in the north of Lisbon at almost 8 kilometres north of Lisbon’s city centre and not far away from Lisbon’s other major stadium, Estádio José Alvalade. The stadium lies adjacent to the E1 (Av. General Norton de Matos) motorway. Take the exit toward Benfica. The stadium is clearly visible from the motorway and signposted coming from the east. If using public transport, Estádio da Luz can be reached with the blue metro line. The blue line can be boarded at several stations in Lisbon’s city centre, e.g. at Baixa-Chiado. Get off at station Colégio Militar/Luz, which lies right next to the stadium. Buses that pass the stadium are line 703, 726, 729, 750, 765, 767, 768, and 799. They stop either at metro Colégio Militar, at the Estrada da Luz, or at Av. General Norton de Matos (line 750). Estádio de Luz is surrounded by motorways and apartment blocks, and the area is not particularly suited for walking around. There is therefore little reason to head to the stadium too much in advance and eating and drinking is best done in Lisbon’s lively city centre. However, if you do find yourself at the stadium with some time to spare, then you can head to large shopping centre Colombo right across the Av. General Norton de Matos, where you can find a decent selection of restaurants of various cuisines, a few coffee shops, some bars, and a cinema. There are no hotels in the immediate vicinity of Estádio da Luz, but if you wish to stay as close as possible, you could pick one of various hotels near the Praça Espanha, which is just at walking distance, but also on the blue metro line. Hotels in the area include the typical chain hotels such as an Ibis, Mercure, Novotel, and the Portuguese chain SANA Hotels. These all get good reviews and are very reasonably priced around €60.00 to €70.00 per night. The Lisbon Marriott and Corinthia Hotel are more expensive alternatives. 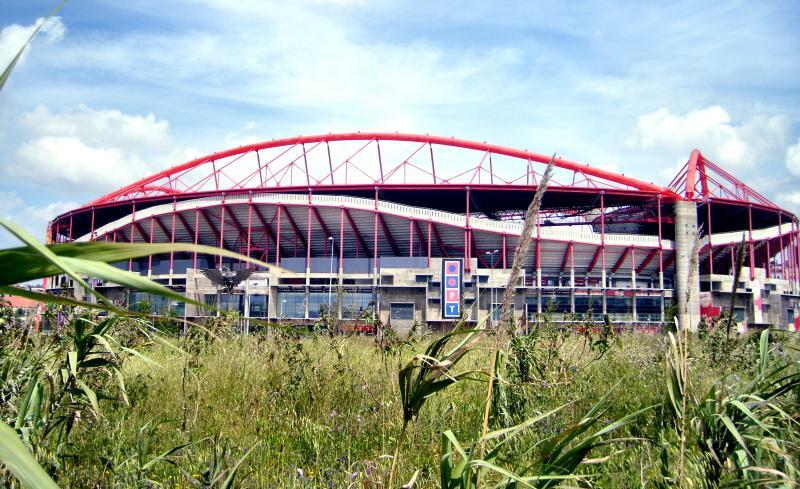 Click here for an overview of all hotels near Estádio da Luz. Of course, if you have more than a day to spare, staying in the city centre will likely be more convenient. Click here to explore the options in central Lisbon. Tickets for Benfica games can be purchased online, or at the ticket office at the stadium. Tickets can also be bought on the day of the match at the gates of the stadium. Apart from the odd match against Sporting or Porto, Benfica does not tend to sell out. Ticket prices typically range from €20.00 for a seat behind the goal to €60.00 for a middle-tier seat at one of the long sides. For more information call +351 21 721 95 00. 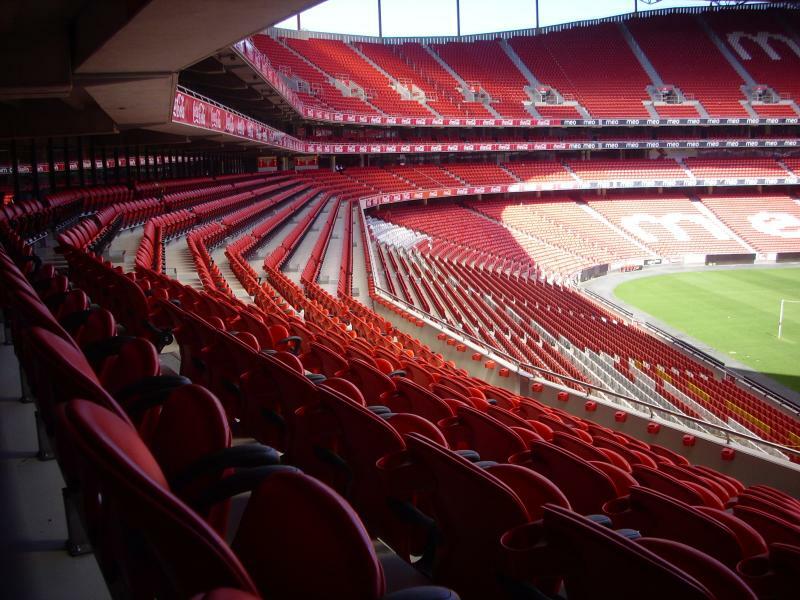 Benfica organise guided stadium tours around Estádio da Luz that include access to the VIP areas, players tunnel, dugouts, and the away team dressing rooms. The stadium also houses the Benfica museum. Tours run every half an hour between 10:00 am and 6:00 pm. There are no tours on matchdays. The tour costs €10.00, while including the museum costs an additional €5.00. SLBenfica.pt – Official website of SL Benfica. Metrolisboa.pt – Information on the Lisbon metro. Carris.pt – Information on Lisbon’s bus services. Amazing Stadium i was there last year during the derby between Benfica and Sporting and it was amazing, the atmosphere and the adepts have no equal and the game was good as well, very intense. I went to watch Benfica against Vitoria Setubal a few weeks ago. Metro stop is just outside the ground so journey from city centre is very convenient. Bought ticket just before the match for 27,5 Euros. I sat in 4th row on one of the sides. Great atmosphere with around 60000 fans inside. Loved the eagle flying around before the kick-off. Amazing atmoisphere, great game. Visited this stadium with 6,000 Celtic fans for a champions league match in 2006. We (Celtic)lost but we had such a great time. The Benfica fans were fantastic and made the whole day so special. After the match a group of Benfica fans took us around the old parts of the city (to the bars of course) They were very gracious and welcoming and we left with a very positive impression of them and the city. Security was not threatening and police were patient with the Celtic supporters in the Centre of town who were determined to have a great party. There was no tension. Stadium itself was simply awesome. Well worth a visit. Benfica V. FC Arouca, Portuguese Primeira Liga. Saturday 5th October 2014. 6pm. It was with a great deal of excitement that I arrived for this Portuguese Primeira Liga match with my friend Quique on holiday. A number of emotions filled my head … with Benfica’s Old Estadio da Luz (Stadium of Light), a legendary ground and one of the largest stadiums in the world (with a record attendance of a staggering 135,000 in the 1980s! ), demolished over a decade ago to make way for Benfica’s Centenary and Euro 2004, I had fond memories of my previous visit to Lisbon in 1999 when, on a half-day Tour of the city, a very kind taxi driver and huge Benfica fan by the name of Jorge Máximo took my parents and I inside the Old Stadium to the very imposing press box with panoramic views across the pitch. I wondered if history would repeat itself and we would meet him again? Today, Benfica were playing a so-called ‘run-of-the-mill’ League match against FC Arouca, a provincial club from the green valleys of northern Portugal. But a visit to Benfica’s iconic Estadio da Luz is anything but ordinary, as we found out at the start of our holiday with a visit to the Club’s spectacular Museum, surely one of the finest in the world of football, with Benfica’s 2 European Cups, the last of these won in 1962, proudly on display, along with the gleam of approximately a thousand other trophies. On arriving at the Stadium it was confirmed to us that Benfica has one of the highest club memberships of any football club in the world (reaching an incredible 200,000 in 2009). Hailing from London, I’d already visited the Arsenal and Chelsea ones (well worth a visit in their own right) and also the Real Madrid Museum a number of years ago as a student on my Uni. Year Abroad in Spain, and this was almost its equal! The visitor was reminded that Benfica is not just a football club … the Club has a proud record of success in swimming and athletics, among other sports, too. The stadium itself was already familiar to us, as we went on a Stadium Tour on the same day as our Museum visit. It’s pretty impressive, especially on the inside, and has an imposing Benfica Eagle (called ‘Aguia Vitoria’ in Portuguese) as you approach it from the pedestrian tunnel. It’s more than similar in design to Arsenal’s Emirates Stadium, having been designed by the same company of architects, HOK, with the only real major differences being the lack of padded seats in the Lisbon equivalent and also a slightly larger capacity at 65,000. In my opinion the outside of the ground could have benefited from some pictures of famous past players or glories to make a more interesting impact on the visitor, as at Arsenal. Being a little more than a decade old (the ground opened in late 2003) and having already staged key Euro 2004 matches, including the Final (a painful defeat for Portugal) and the all-Madrid 2014 Champions League Final, it’s already had a more ‘eventful’ history than other recently built stadia, I would say. And I mustn’t forget to mention that the FIFA under-20 World Cup Final in 1991 was held at the old Stadium, featuring a very youthful Luis Figo and Rui Costa, among other youth prodigies of that era. Our Tour Guide told us Portugal won 4-2 on penalties against their Brazilian rivals to send the massive crowd into rapturous celebration … a match still fondly remembered in Portugal to this day. The Stadium is located in the northern suburbs of the City next to a rather confusing network of motorways, only a few kilometres away from its fierce city rivals Sporting Portugal. However, public transport links are good … with the Colegio Militar Metro Station at the nearby Colombo Shopping Centre a 10 minute walk away. After a quick drink in the shopping centre, we crossed the Highway along with other fans and walked under a slightly strange pedestrian tunnel to reach the ground. I could sense there would be a pretty decent-sized crowd there already milling about outside … and there was. (Supporters don’t tend to arrive close to kick-off in continental Europe). This was 45 minutes before kick-off, so we decided to go straight into the stadium, where we were pleased to find our seats were at the front of the lower tier and quite close to the FC Arouca bench and manager. A great view of the action … and our ticket only cost 19 Euros! Shortly after the players returned to the tunnel after their warm-up, a rather unusual event took place. Benfica let their eagle, and club emblem, fly around the stadium, and back to its keeper. The only other club I can think of in the world that does anything vaguely similar is Crystal Palace,but I would guess that Benfica were almost certainly the ones who started it off! Benfica’s club anthem sounded epic as the players walked out of the tunnel and most fans held their scarves aloft in a way that was reminiscent of a matchday at Anfield or Celtic Park. The evening began on a poignant note … a minute’s silence in remembrance of what appeared to be a former Benfica manager who managed the club some years previously. The first half was a pretty strong display from the Home side with some bright passing and interplay, but it lacked the all-important goal. Arouca were very well-organised and defended impressively. Their tiny pocket of supporters located high in the corner were certainly the happier of the two sets of fans as the half-time whistle blew, especially considering the vast difference in resources between both clubs. The interval provided me with an opportunity to wander around the concourse … the usual beverage stalls were present here, with your standard fare of Mars bars, etc, all on offer at vastly cheaper prices compared to English Premier League grounds! There was ample space to move around, as you would expect from any ‘modern’ stadium. Half-time also provided an opportunity for the ‘Casas Benfica’ to parade around the pitch with their banners. These were Benfica supporter clubs from all over Portugal who were attending the match that day. The Second Half was a pretty similar story to the first half … until Benfica produced their long-awaited goal in the 75th minute. One-time Chelsea transfer target Talisca opened the scoring. Two more goals arrived in quick succession, with Benfica scoring their final goal in the 88th minute. Cue some spectacular scarf waving around the ground, as well as a flare display by Benfica Ultras Diabolos Vermelhos (first I’ve ever seen live!) after the third goal. The 4-0 Final scoreline was rather harsh on the visitors, but that’s football … just what Benfica needed after their morale-sapping Champions League defeat midweek against Bayer Leverkusen. An attendance just shy of 42000 flashed up on the screen … quite impressive considering the relative non-importance of the game! We were also glad to know that there weren’t any hiccups with the roof structure during the match, as earlier in the year a derby match against Sporting had to unfortunately be called off as parts of the stadium roof fell on the pitch. We thought we’d seen everything after a great day, but yet another surprise was in store … THAT taxi driver Jorge Máximo from fifteen years previous was standing only a few rows behind us!! I HAD to speak to him. In my wallet I had a photo taken all those years ago of him and me as a boy in the Old stadium. I showed it to him … I conversed in broken Portuguese and he bought both me and my friend a Benfica scarf to take home with us. What a generous gesture! But he wasn’t finished there … after a brief conversation and introduction to other fervent Benfiquistas, he beckoned us down to the underground car park used by players and VIPs and very kindly drove us back to our city centre Hotel, past the beautiful Marqués de Pombal roundabout. The car park is excellently designed with a special slip road leading straight onto the Highway, and saved us the hassle of queuing up afterwards at the Metro. If any of you readers hope to travel around Lisbon with him in his taxi, I’m afraid it won’t be possible as he informed us he recently retired from his occupation. Quique and I had memories to last a lifetime. During my holiday I also found time to quickly visit Sporting’s Estadio Alvalade, another modern arena (and Cristiano Ronaldo’s shirt in the Museum) which deserves a look, too. To anybody fortunate enough to visit Benfica’s ground … don’t forget to visit Eusebio’s Statue and ‘shrine’ outside the Stadium near the Junior Team football pitch, in honour to the great man who sadly died in early 2014. I hope to return to Portugal one day but this time explore the northern part of the country, around Porto, the country’s 2nd city. In my opinion the country is rather underrated, especially as much more publicity is devoted to its somewhat higher-profile neighbour, Spain. Went here with Spurs. Seats allocated high in the corner of one end. A few mobile bars / fast food vendors outside the ground but not much else about and police were keen to get us into the ground. They were all in full Robo-Cop body armour and we’re fairly threatening without actually assaulting anyone. The ground was 3/4 full but there was not a great atmosphere – I think the home fans already considered the tie won following a good win at White Hart Lane. And Benfica are used to competing in the Champions League rather than the Europa League. We were kept in for about 40 minutes after the game to allow home fans to disperse but the Metro then ran fast all the way back to the centre of the city.